If I were to ask you to search for a picture of a person practicing yoga, or for articles on the practice of yoga, who and what do you think you would see? Chances are you would see what appears to be a white, slender, fit, female and you would find information on "yoga workouts" and "de-stressing with yoga." In other words, a cultural appropriation of yoga. You may or may not be aware of yoga's foundation and original purpose and the ways in which the West has appropriated a deeply cultural practice with serious spiritual underpinnings. Whether you fit the description above or not, we all must be aware of the ways that we participate in and potentially abuse cultural practices that may not have any roots in our personal ancestry. This week we are going to continue our journey through different wellness practices by doing a bit to break down the practice of yoga. A series of searches will show you many types of yoga, frequently laid out in lists and charts to help you find the one that's right for you. You will find that bikram yoga, or more broadly hot yoga, is made up of 26 poses that focus on alignment and muscles loosened by the 105 degree temperature that founder Bikram Choudhury insisted on. You will find that hatha yoga is slow and gentle, that vinyasa is defined by continuously flowing between postures, that kundalini is focused on releasing energy from the root chakra around your lower spine through postures focused on your core, that ashtanga can also be called power yoga and is made up of a set series of poses created in the 1960s by Pattabhi Jois, that Iyengar is focused on alignment and holding poses for longer periods of time as BKS Iyengar put forward in the 1930s and so on and so forth. You will find Western descriptions of cultural practices meant to round out your fitness routine. Dig a little deeper and you're bound to find a more complete version of yoga, one that acknowledges and honors its foundation. "Yoga" comes from the Sanskrit word "yuj," which you can interpret as "union." Yoga has been practiced for some 5,000 years in India starting as an oral tradition shared from teacher to student. Vedic (or archaic) yoga aligned with the ritual life of ancient India. It was focused on the idea of sacrifice to join the material world and spirit. In order to achieve this union, practitioners had to focus for long periods of time to go beyond their mind's limitations and experience visions. In preclassical yoga we find the importance of the Upanishads and the Bhagavad-Gita, Hindu texts that discuss the unity of all things and the active opposition of evil in the world. Classical yoga includes the Yoga Sutra, yogic teachings that the Indian sage Patanjali wrote down 2,000 years ago. Patanjali departed from the idea of union and instead subscribed to the idea that yoga helps to separate the material body of a person and the spirit, therefore restoring the spirit to purity. Post classical yoga found itself back to the idea of union. It had strong roots in the Upanishads and claimed that everything and everyone is an expression of one and the same reality, which is called Brahman or Atman. "Om," which is the sound we may make together at the beginning and end of our practice represents the sound of the universe and "Namaste," the word we use to close our practice means, in one translation, "the light in me recognizes the light in you." These are all beautiful expressions of oneness with everything and everyone in the constantly moving universe. Modern yoga originated with Swami Vivekananda in the Parliament of Religions in Chicago in 1893. The place and date of the birth of modern yoga is extremely important. During this time, India was still subject to British colonial rule. While Great Britain colonized India from 1858-1947, they banned the practice of yoga in India. It was just one of the ways that they attempted to strip India of its strength and culture. This history and foundation make it all the more important that we recognize yoga as not belonging to the West. People and places outside of India and the Indian diaspora should practice yoga for a variety of reasons but should never forget where it comes from and what it means. Much of the historical information here was culled from http//swamij.com/history-yoga.htm. We encourage you to explore more there. 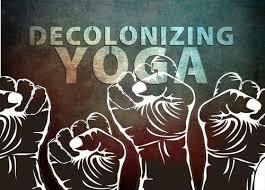 We also encourage you to explore more thoughts related to decolonizing your yoga practice at http://www.decolonizingyoga.com/, which also shares insights into the relationships with race, gender, etc. inherent in the decolonizing process. We also encourage you to recognize the parts that Yoga Alliance and popular journals like Yoga Journal play in this. We tried searching "cultural appropriation" on the Yoga Journal website but it returned "no results found;" perhaps you'll have more luck.